5' 8" (1.73m) from the floor to the centre of the bulls eye. 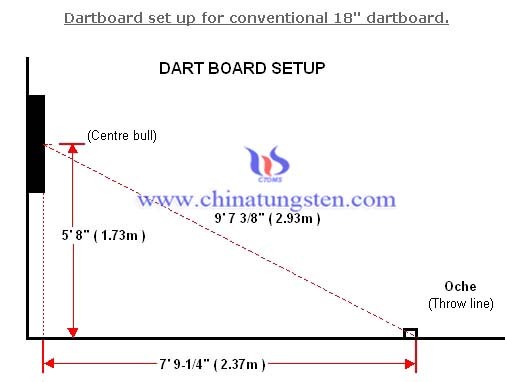 7' 9 ¼” (2.37m) from the board to the throw line or 9' 7 3/8” (2.93m) when measured diagonally from the bulls eye to the throwing line). This second measure is used when playing on an uneven surface. 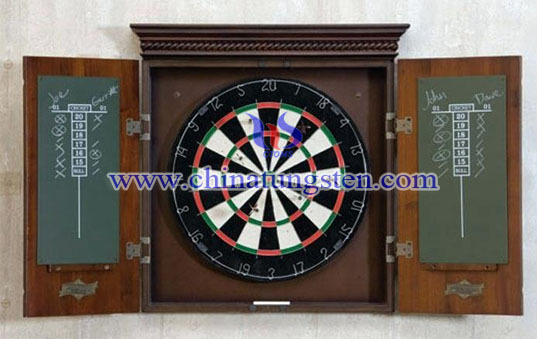 Preferably 2' (0.6m) clearance both sides of the board (remember darts are sharp!). The board should be mounted flush to the wall not leaning forward with D20 directly at the top. 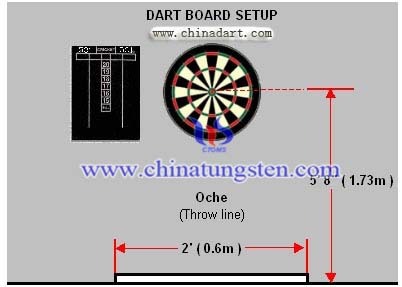 Soft tip boards in some cases are set the same as per steel tip boards, but some leagues have a longer throwing distance. I.e. 8’ (2.43m) not 7' 9 ¼” (2.37m). If you are setting up a board for league games, first check you local league rules. A commonly asked question is what distance should ladies throw from. Well basically BDO World Championship ladies throwing distance is the same as the men's, 7' 9 ¼” (2.37m). But many leagues around the UK have different throwing distances for ladies. The most common distances other than 7'9 ¼”, is 7'6" & 7' 0". Other distances for men include 8' 0" & 8'6" but this is now uncommon. 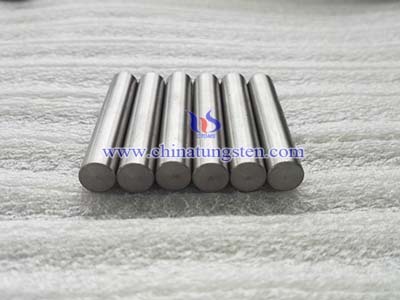 Tungsten dart billets are the rods used for making dart barrels.Today's standard material for barrel is tungsten heavy alloy, and barrel forms the main part of a dart (mainly used in sports). 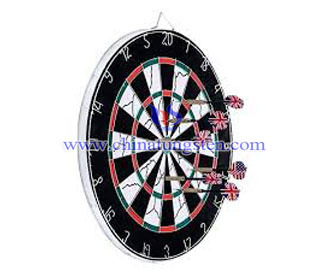 The most crucial comprises of dart is the barrel. This is the part of the dart you grip when you throw and it also gives the dart its weight. The shape of the barrel will vary depending on where the weight is concentrated. 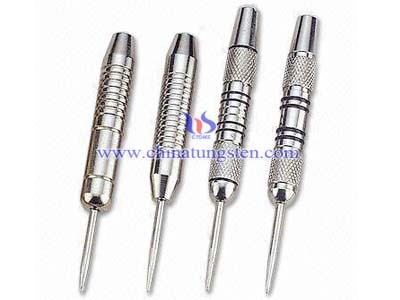 Tungsten is a very dense material, so darts with a considerable bulk can be made quite slim. 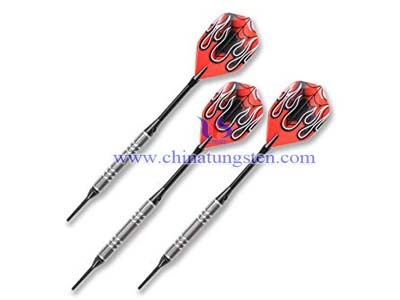 The invention of tungsten darts had a big impact on the sport. With the new darts it was possible to achieve much better grouping than before, and the averages in pro games have improved dramatically. 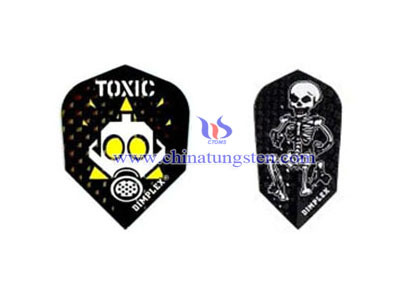 Dart flight is the fins or wings found at the back of a dart, which stabilize the dart during flight and are made of various materials. It is not generate lift, airplane wings generate lift by means of their curved shape, whereas dart flight is flat. They only resist motion away from the centerline of the dart.